The Great Barrier Reef (GBR) is one of Australia’s most precious natural icons. It is also an area under considerable stress from multiple sectors and uses, and long-term and short-term threats, with conflicts over use of the GBR continuing to intensify. The GBR is regulated by a complex patchwork of laws, policies and regulations at the international, national and State levels, with Ecologically Sustainable Development (ESD) woven throughout. In light of continuing management challenges and disputes over appropriate use of the GBR, it seems timely to consider whether ESD is an appropriate conceptual underpinning for its legal regulation. This article will provide some observations on this question, by reference to four recent case studies of decisions made regarding the GBR. It will conclude that ESD has afforded decision-makers a significant degree of administrative discretion, and may need to, at least to some degree, be revisited. Wild horses have been present in Kosciuszko National Park for generations, contributing to the romanticism and mythology of the “high country”, but at a significant ecological cost. Despite broad scientific agreement on the need to actively manage wild horse populations in the National Park, such proposals continue to generate controversy. In 2018 the NSW parliament passed the Kosciuszko Wild Horse Heritage Act 2018 (NSW) to recognise the heritage value of maintaining wild horses in the National Park. Legal protection of wild horses in the National Park has the potential to undermine national environmental conservation objectives, however fails to trigger the Commonwealth’s primary environmental legislation, the Environment Protection and Biodiversity Conservation Act 1999. This article explores what the Kosciuszko Wild Horses Heritage Act reveals about the scope and limitations of the Environment Protection and Biodiversity Conservation Act in protecting Matters of National Environmental Significance, and proposes changes that could be made to facilitate effective Commonwealth intervention. Since 1933, Australia has continuously maintained a claim of sovereignty over an area comprising almost 42% of the Antarctic landmass. In response to Japan’s controversial practice of whaling commercially within waters off this continental shelf, successful challenges were brought before both the Federal Court of Australia and the International Court of Justice (ICJ) (in 2006 and 2014 respectively). In turn, Japan subsequently issued a special declaration withdrawing itself from the ICJ’s compulsory jurisdiction pertaining to wildlife and natural resource management and resumed whaling within the disputed zone. This article will explore the ramifications of this outcome on the integrity of Australia’s continued claims to sovereignty over the AAT, arguing that the United Nations Convention of the Law of the Sea (UNCLOS) provides a compulsory arbitration mechanism so robust in its design and operation as to render the Japanese declaration futile in effect. 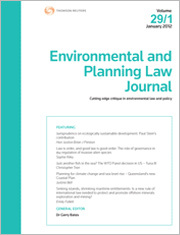 This article will explore the value of the Tarkine as estimated in law, politics and in society. It will analyse the judgments of the four related cases in their political context and use recent Tasmanian political history to illustrate how and why these contentions have arisen. The legal analysis will involve the relevant jurisprudence (in four related cases) and statute, namely the Environmental Protection and Biodiversity Conservation Act 1999 (Cth) (the EPBC Act or the Act). This analysis will address how the statutory term “action” (with regard to the proposed 4WD tracks and associated works) is interpreted and applied in these four cases. It will also examine how the court understands and evaluates the “value(s)” of the Tarkine, as a place of National Heritage, and whether it embodies the requisite “indigenous heritage value(s)” to trigger federal intervention or approval of any action. For the PDF version of the table of contents, click here: EPLJ Vol 36 No 2 Contents.